Our SNM IAS Academy educate and we know education without values, morality and ethics is no education at all. Our faculty has the experience of teaching civil services and judicial services aspirants for more than 8 years. Rigorous tests, up to date printed materials, highly innovative techniques developed by the teachers, regular motivation sessions, special problem solving sessions, keeping pace with the recent trends of the exams etc. are the hallmarks of the institute. The Conduct special Classes, Tests, Seminars, and Interview Sessions, besides Lectures on Compulsory and Optional Subjects are exclusive hallmarks of our institute.SNM IAS ACADEMY(Institute) provide all civil services exams(IAS,PCS,HCS,HPAS) coaching classes in Chandigarh. If you want any information about civil services exam coaching batches or join our academy for IAS,PCS ,HCS,UPSC exam coaching in Chandigarh ,contact with us at: 0172-4665252, 9814821057 or website visit for more details . 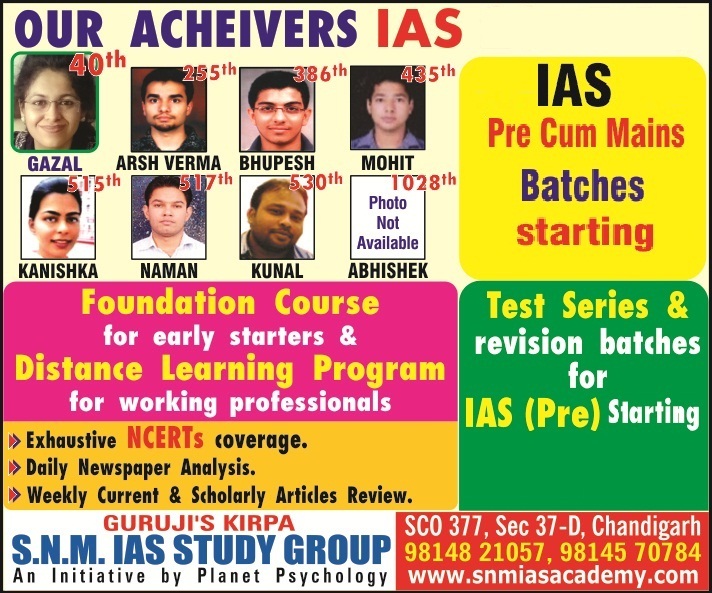 Welcome at SNM IAS ACADEMY Chandigarh. While preparing for Civil Services exam, it is very difficult to get relevant information in a comprehensive format. Realizing the existing gap, this book has been compiled to create consolidated current affairs material for State and UPSC Preparation.SNM IAS ACADEMY CHANDIGARH provides the civil Services exam coaching.